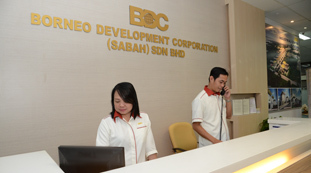 Borneo Development Corporation (Sabah) Sdn Bhd, 'BDC Sabah', a private limited company incorporated on 15th May, 1992 is wholly-owned by the State Government of Sabah. It is an offshoot of Borneo Development Corporation Limited 'BDC', a company established in 1958 by the Commonwealth Development Corporation primarily to promote the growth of industry and commerce with the aim of diversifying the economies of Sabah and Sarawak. In 1962, BDC was restructured to include 50% participation subscribed to equally by the Governments of Sabah and Sarawak. It was one of the first business dealings involving the two State Governments prior to the formation of Malaysia. The first office of BDC was set up in Kuching, Sarawak in 1958 and the Sabah Regional Office in Kota Kinabalu in 1962. In 1969, the name Borneo Development Corporation Limited was changed to Borneo Development Corporation Sdn. Bhd. The first major change came in 1975 when the State Governments of Sabah and Sarawak bought over the shares of the Commonwealth Development Corporation. That made BDC a private limited company wholly-owned by the Governments of the two Malaysian States of Borneo. The rate of development brought another major change in 1992 when the two partners agreed that it would be practical for BDC to exist independently in each State. Thus, were born BDC Sabah and BDC Sarawak. On 1st July 1992, BDC Sabah commenced operation taking over BDC's operation in Sabah.